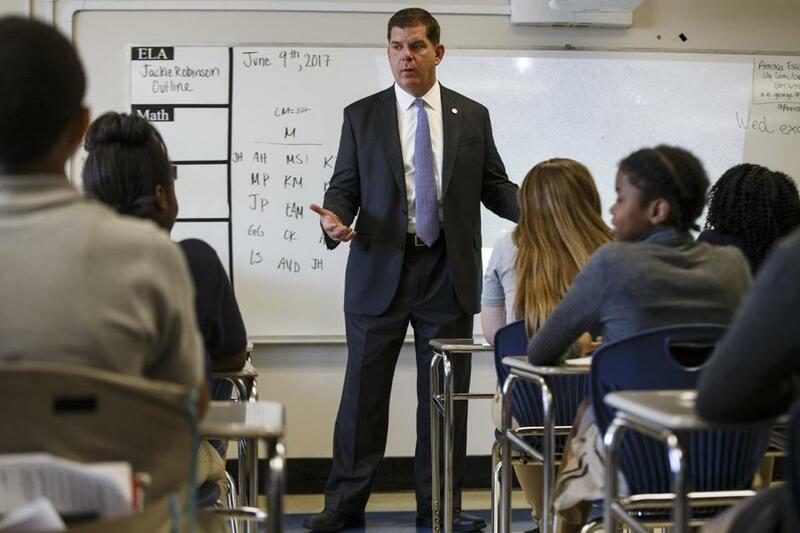 Boston Mayor Marty Walsh talks to middle schoolers during a tour of their school in June 2017. Student activity accounts and other funds managed directly by individual Boston public schools across the city are rife with questionable spending and sloppy bookkeeping, including countless missing receipts and invoices, according to an outside audit. The audit found problems at nearly every one of the 118 schools it examined, some minor, some significant. They mirror those found by the IRS last year when it examined just 16 schools. Like the IRS probe, the new audit also found a pattern of schools dipping into student activity accounts or other funds to pay school or city employees off the books for extra duties and not reporting the earnings to the IRS. Mayor Martin J. Walsh ordered the review, which was conducted by the accounting firm Ernst & Young, after the IRS probe raised questions about whether the problems it uncovered were rampant across the district. The city has never audited the student activity accounts before, even though state law requires an annual review and a formal audit every three years for any student activity account exceeding $25,000. The strict audit rules are for good reason. Student activity accounts must be used only to support experiences outside the classroom that supplement a student’s education, such as field trips, student clubs, and special events, including proms. Money is typically generated by fund-raisers, unsolicited donations, and ticket sales for student events. The review found no questionable spending that rises to the level of a criminal investigation, although city and school officials plan to probe a handful of cases where concerns over spending persists. Interim Superintendent Laura Perille said the systemwide audit has already resulted in greater accountability, transparency, and managerial control. The results of each school’s review are being posted on the School Department’s website. The Globe and two other media outlets received a preview on Thursday. Many of the new policies and procedures have been in the works since the IRS probe and have largely been implemented. The IRS levied a $30,000 fine and significant blame on School Department headquarters for failing to create uniform procedures, policies, and staff training to ensure appropriate spending. In one significant move, schools are now required to place all student activity funds in a citywide master bank account, where money will be dispersed through the city’s payment system. The school system also ordered schools last year to stop using ATM cards associated with the student activity accounts and to destroy them. The review found the ATM cards and other noncheck transactions, such as wire transfers and PayPal, were quite popular with the schools, accounting for $887,229 in withdrawals over a four-year period. Such transactions make it difficult to track how money is being spent. City and school officials said they still don’t know exactly how many school accounts existed and what the total amount was because that data from the 118 individual school audits were not tallied up. But Perille said they estimate that student activity account spending makes up less than a half percent of the school system’s $1.2 billion budget, or less than $6 million. The School Committee plans to adopt other policy changes in September. It remains unclear why so many schools did not keep receipts or invoices. Auditors, like those at the IRS, experienced difficulty in determining whether spending was appropriate because many schools were commingling student activity funds with other accounts, such as those for parent councils, and failed to record what money was being used for which purposes. ■ The Eliot K-8 School in the North End collectively amassed about $100,000 in one bank account and four other funds for student activities, an Italian language program, and other school functions. Auditors also determined by sifting through public records its parent group has another $350,000 in its own account. Yet auditors were unable to verify spending because the school said it lost all of its receipts, invoices, and other documents when it moved into a newly renovated building last fall. ■ The Murphy K-8 School in Dorchester was faulted for failing to fill out proper paperwork for some vendors, potentially preventing the IRS from collecting appropriate taxes. For instance, the Murphy spent $1,391 at the Blarney Stone restaurant in 2014 and $756 in 2015, paid Scholastic Book Fair $41,220 over three years, and gave the Globe Santa charity $619. ■ The Josiah Quincy Elementary School in Chinatown used student activity funds to pay school and city employees for extra duties and to pay independent contractors. One employee was paid $32,504 over four years for recess supervision and office work. The school had no standard process of collecting or reporting tax information. ■ New Mission High School in Hyde Park was unable to produce 49 banks statements for a student activity account that had an ATM card and had only two years of spending records. The school, which closed the account in January, did not know how it would pay for graduation, prom, and other student activities for the rest of the year. Auditors later learned the school failed to disclose it had another account, for a foundation grant, that had no ledgers or receipts, or other associated documents. ■ Boston Adult Technical Academy in Bay Village, and the Higginson-Lewis K-8 and the Dearborn STEM Academy in Roxbury were among a handful that maintained all student activity funds in cash. But these three schools failed to consistently record cash collections and maintain receipts. Walsh said he appreciated the cooperation of school leaders in conducting the review and for embracing the new guidelines. “Trust, transparency, and being fiscally responsible for the residents of Boston is what drives our priorities and this in-depth review has allowed for the creation of substantial and comprehensive new policies and procedures,” Walsh said in a statement. The IRS audit findings, which were originally reported by the Globe in November, created a public uproar and tension between Walsh and then-Superintendent Tommy Chang. Walsh said Chang failed to tell him about the findings, even though the IRS probe was part of a broader audit of city finances that resulted in a more than $900,000 fine that was paid by the city before the Globe story. The School Committee also said it did not know of the IRS findings until the Globe began making inquiries. The IRS examined three years of spending just prior to Chang becoming superintendent in 2015. He resigned in June.